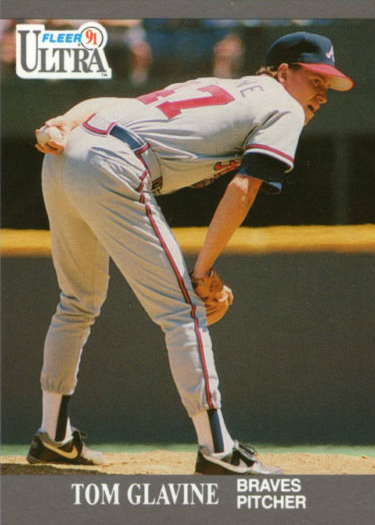 Happy 47th birthday to Braves legend Tom Glavine, 2-time Cy Young winner and future Hall of Famer! 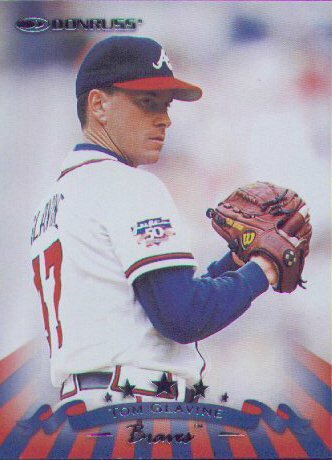 I owned this 1991 Ultra #5, a glossier set Fleer produced to compete with Upper Deck's surge of photo-driven market success. 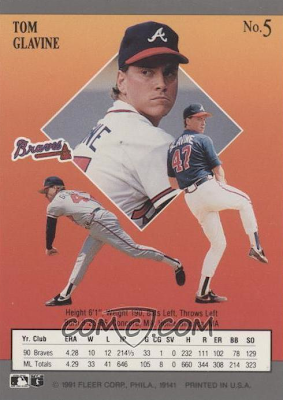 Designers put no less than four different poses of Tom onto this one card, showing off several stages of his delivery and multiple uniform combos. Too bad the orange background gradient makes it look so dated! 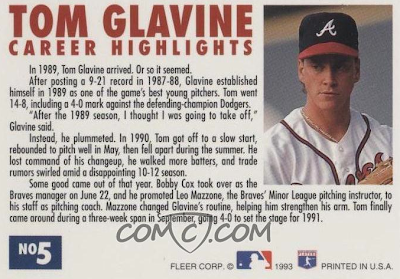 Fleer upped their game in 1993 with a dedicated Glavine highlights subset (including this #5) and he rewarded collectors with a 3rd-straight 20-win season (career stats). 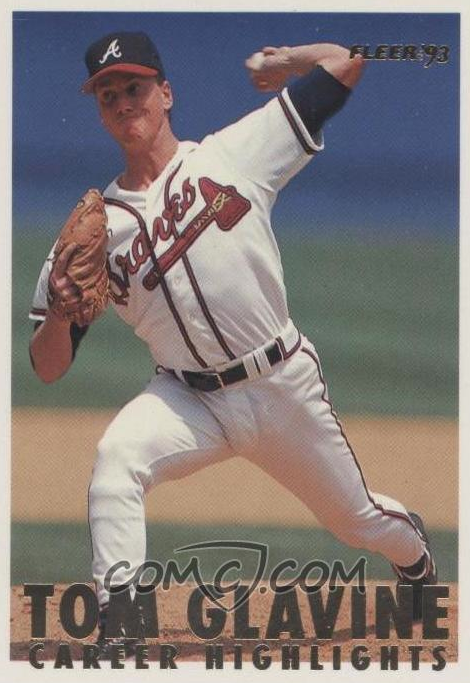 It feels weird in retrospect for a 27 year-old guy with barely 60 career wins to receive a dedicated subset, but Atlanta rode high during that Ted Turner era of Maddux, Smoltz, Glavine, and TBS. The junk wax era meant tons of product, so stars served double or triple shifts on cardboard. An icon of durability, Glavine started at least 32 games 12 straight years from 1996 (age 30) to 2007 (age 41). Tom won 20 games for the 4th time in 1998, edging out Trevor Hoffman (53 saves) and Kevin Brown (18-7) for his second Cy Young. Donruss matched Atlanta's team colors well, thanks to the team's taste for red, white, and blue. So glad it wasn't teal and tangerine. 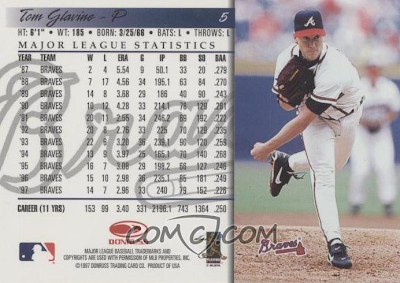 At the 11 year mark in 1997, half Glavine's career, he'd won 153 games. Over the last 11, he won 152 more. EERIE CONSISTENCY. Value: Cooperstown plaque or no Cooperstown plaque, most Glavine cards come cheap thanks to ready availability. All of these should cost less than $1 online or at shows.